Our weekend warrior workout version one was a hit SO we decided to turn up the heat and deliver a Body Burn® Weekend Warrior version TWO! If you’re a beginner, you can cut down on the amount of rounds that you do in this workout and build yourself up. I have included images below for each exercise to help you navigate if you don’t know what the exercises looks like. Remember to have fun with this! Get your friends involved, you could even post it on Facebook and tag your friends as a way to keep people committed! Use our personalized image below to share on your face book, pinterest, OR other social media platforms. Spread the fitness love and get others to workout out! Challenge Yourself AND Your Fitness Buddies Using This Image Below! Use this weekend warrior workout to get back in shape for spring and summer! 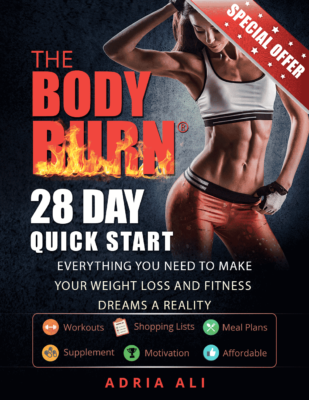 Simply hover over the image to share your “I Just Completed the Body Burn Ultimate Weekend Warrior Workout” it will show you all of your sharing options when you do! Spread the fitness love and get others to share in your passion for a better, healthier body!